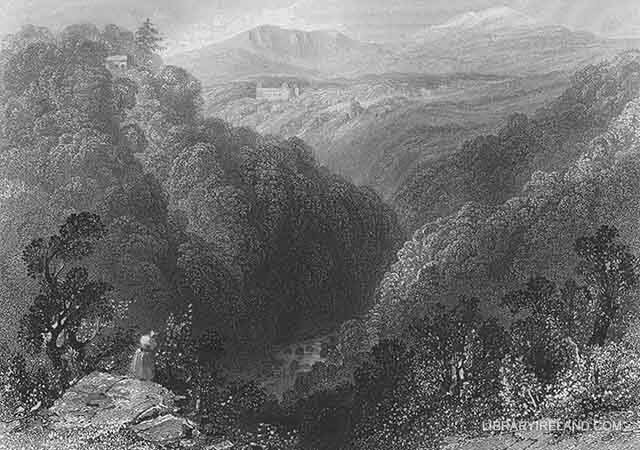 The noble mansion of POWERSCOURT is seen to most picturesque advantage from the eminence above the Dargle. Surrounded by magnificent woods, and gleaming with its fine granite facade above the deep and leafy valley which it dominates, it looks like the proper residence of a lord of the soil. There is something very Italian too, or rather, we should say, something like the compositions of the Italian masters in the scenery of this valley. Tennehinch, formerly the seat of Ireland's eloquent patriot, Grattan, forms such a feature in the picture as a painter would introduce; it is situated lower down, on the banks of one of those tributary streams which mingle their waters with those of the romantic Dargle. The deer-park of Powerscourt is rich in natural beauties, but its principal attraction is the celebrated POWERSCOURT WATERFALL, which is seen at the extremity of a beautiful semicircular amphitheatre (formed by mountains wooded to their summits), tumbling over an almost perpendicular wall of ferruginous basalt, nearly two hundred feet in height. This picturesque cascade is supplied from a very inconsiderable stream, and when unaugmented by heavy rains, the volume of descending water is so very small that the face of the rock is seen through the thin veil of its delicate transparency. But in winter, or when the channels of the mountain have been charged by recent rain, the tumultuous fury with which the thundering cataract dashes at one wild bound down the frightful depth of its descent, fills the beholder's mind with wonder. 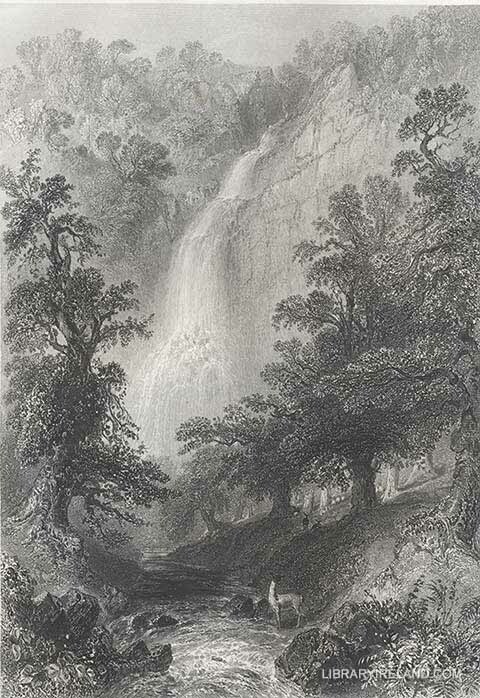 The profound seclusion of the glen favours the peculiar awe with which this scene never fails to impress the spectator, when beheld under favourable circumstances; and the dark masses of the contiguous woods, rising in sylvan beauty to the tops of the mountains, afford a delightful contrast to the white foam of the cataract and the dancing waters of the stream, sparkling in the gleams of rich sunlight that break through the branches of the overarching trees.